If you live in Cagayan de Oro (or you’ve been to Davao or live in Davao), you’ve probably heard of Mandarin Oriental Restaurant. 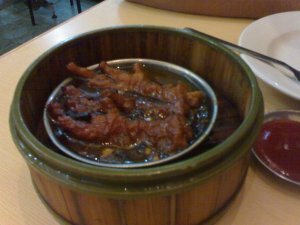 It’s one of the most sought after restaurant because of their authentic Chinese dishes, especially Tausi Chicken Feet. Since eating out is no longer practical considering the current financial dilemma almost everybody is experiencing, we experimented on cooking the recipe ourselves and enjoy the same authentic Chinese delicacy in the comfort of our dining room. It took a while for us to get the dish perfect, but when we did, the hard work was worth it! Delicious and distinctively Chinese, this dish is worth a try for those who are willing to try something new… even exotic to some! But for those who can afford to dine out whenever they want, Mandarin Oriental Restaurant is a great place to dine. They have branches in Robinson’s and along Velez Street (near VIP Hotel). Here’s our recipe. Hope you’ll try it! Clean thoroughly the chicken feet. Wash and drip dry. Rub the chicken feet with the yellow food coloring. Use only a small amout. We’re only after the color. Set aside. Heat oil in a wok; deep fry the chicken feet until crispy. Drain. Remove excess oil from the wok. Sauté the garlic, ginger, tausi, soy sauce, and siling labuyo. Add the fried chicken feet and the sesame oil. Cover and simmer until the chicken is tender. Add the Barbecue and oyster sauce, simmer some more until the sauce has thickened. Serve on top of cooked rice. there will be cooking oil splattering all over the place. Be extra careful not to burn yourself with the hot cooking oil. How we did it? We covered the deep fryer while cooking.